Snacks are for mouths, not floors! Sometimes it seems all you have to do is follow a trail of crumbs to find your little one. Munchkin's best-selling Snack Catcher® to the rescue! Redesigned portable snack bowl provides everything you LOVE about the Snack Catcher® with added benefits! Upgraded stay-put top is toddler-proof and redesigned silicone flaps are soft on little hands and keeps every crumb contained! The ultimate must-have for independent toddlers to self-feed with a bit more dexterity and a lot less mess. Kids love accessing snacks all by themselves through the flexible flaps, and moms love that those same flaps help prevent food spills all over the house and car. 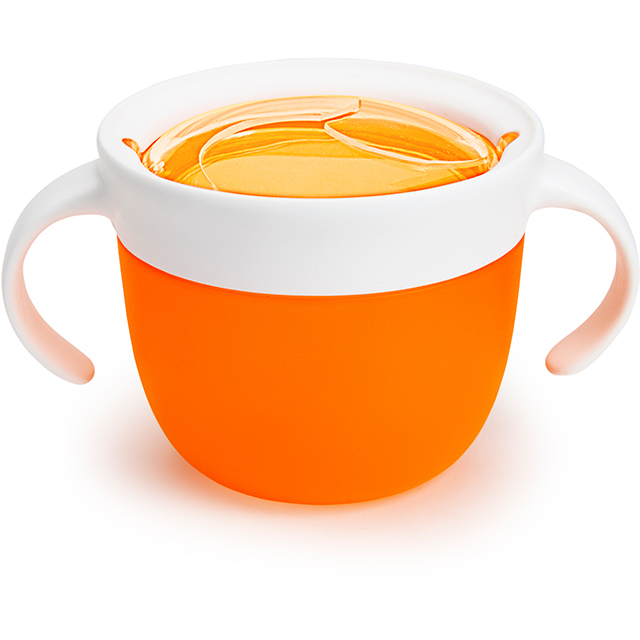 Each spill-proof Snack™ cup has two handles designed for even the littlest hands to grasp easily. And because snacks come out only when they want them to, snacktime no longer means food everywhere except your child's mouth. Win-win for all!